Its a fun skate for skaters of all ages. Plus there is a Roller Skating coach on hand for anyone that needs a little help getting started. All you need is a pair of skates, quads or blades. At the weekend we debuted our new croc ‘boutfits’ at the Big Splash event in Newport. The day began with an exciting start; the Swansea City Slayers played against the Tiger Bay Brawlers B team. The game seemed pretty close throughout and the Brawlers were in the lead with only minutes to spare. Swansea fought to end but they needed something spectacular to take the win. Luckily there was a power jam in their favour in the last jam. Fast feet from the jammer and good teamwork from the blockers gave them the boost they needed to take the game by just a few points. It was a fantastic game to watch and had us on the edge of our seats. Our game came second; we were on a high and were ready to show what we had. This was the first public outing for us as Cardiff Rude Birds and we skated around proudly in our new cartoon style mini dresses. Our opponents, the Tiger Bay Brawlers A team were strong; they took the lead straight away and didn’t give it up. Unfortunately the score wasn’t as close as we would have liked but it was a great learning experience. Hopefully we can apply what we have learnt to our upcoming bouts. Tickets cost £7 (plus 25p transaction charge) online or £9 on the door. Limited tickets will be available on the day. Buy now to avoid dissapointment. PLEASE BRING A PRINT OUT OF YOUR CONFIRMATION EMAIL OR THE TRANSACTION ID / RECEIPT NO AS PROOF OF PURCHASE. You don’t really notice yourself growing up do you? Don’t really notice the minute changes which will eventually equate to the new you. One day you just realise that things have moved on – matured. Maybe that’s a good thing. Maybe noticing these changes would scare you, make you want to pull back to simpler times. Maybe noticing would make you impatient to race toward the next step before you were ready. Maybe being aware about it would help you to feel prepared. Maybe it needs to be a more organic experience. I don’t know. I’m trying not to think about it. Today I’ve been practising my transition stops. This is when you have to do an about-turn (at speed) when coming off the track, pop up onto your toe stops and be ready to skate in the opposite direction. I can’t do it. I think far too much and it trips me up every time. It’s not natural, nor organic. Each move is dissected and scrutinised as if I’m willing my brain to absorb the message like an instruction manual and to direct my feet to follow each step to the letter. I know how, I’m physically able to complete all moves necessary, I have the opportunity to do it. Ironically the only thing I seem to be missing from my transition stops is the patience to actually make the transition. The journey from one end of the task to the other. I just want to be there and I want to do it, the bit in the middle just seems a little bit too frustrating. The middle is where you aren’t buffered by the thrill of anticipation nor the pride of accomplishment. The middle is where you have to make mistakes, have to fail and have to fall – none of which are inherently bad things and all necessary but let’s face it, each fall can be disheartening. But transitioning is a process. For some people it’s quick and natural but for others it’s long and it’s analytical. The visceral vs. the cerebral. I wasn’t born with natural agility (as anyone who’s seen me dance will attest to) and so I have no option but to think each action through and become painfully aware of the process and this recognition forces me to face certain fears. The fear that I’m moving away from a level of the game which is safe and comfortable and the fear that I won’t be able to reach that next stage, that I’ll be stuck in that godforsaken middle again. The only comfort I have is knowing that a transition is a constant evolution, not always in the right direction and sometimes sluggish and hesitant, but the transition is the one thing that will never stop. Armed with this knowledge I should be able to compose myself enough so that I could enjoy the journey and one day become aware of how things have grown. I should be able to allow myself to evolve organically but I can’t, not with roller derby, not yet. Visceral vs. cerebral, heart vs. head. I’m impatient to race towards that next step and will keep tripping myself up until I learn to let it go. Stop. Don’t think, just do. The only thing constant is change and all I can hope is that my eagerness to learn will at least keep me moving in the right direction, no matter how slow. Join us at CRoC’s 1st Birthday Bash! Live-music from Pop-punk covers act KICKFLIP plus alternative DJs. Tickets cost £3 (plus 25p transaction charge) online or £4 on the door. 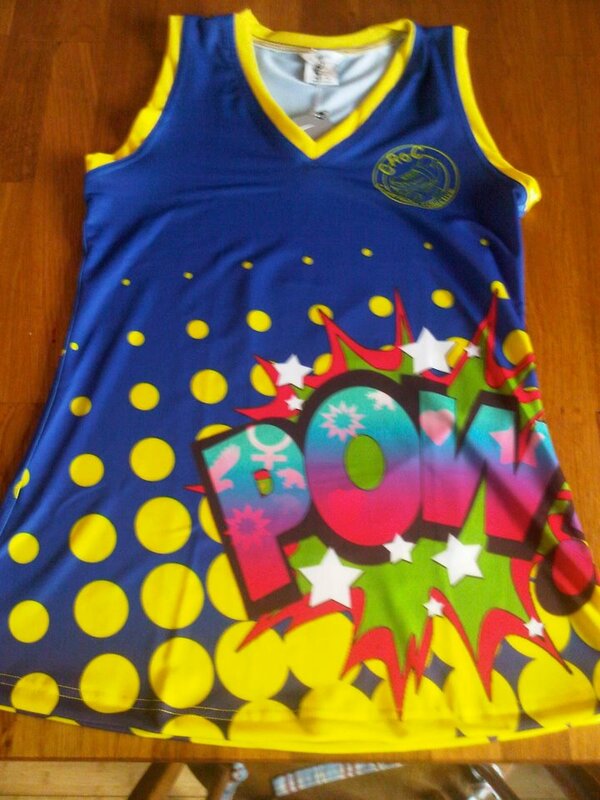 It is fun, fast and in your face – Merby (Men’s Roller Derby) is all of those things. It’s harder than baseball; more physical than football; cheaper and as fast as hockey; and more fun than basketball. I describe it as a combination of NASCAR and hockey with two human pucks!! Ever wondered what Merby is all about? Wanted to give it a go? or simply wanted to get fit, meet some cool people and skate? Want to get stuck in yourself, as a skater or a referee, come along to our intro sessions at Llanedeyrn High School, 22 September 8-10pm. We have some kit available upon request only, if you need anything please drop us a message and let us know. We are planning our first birthday party, more on this soon. 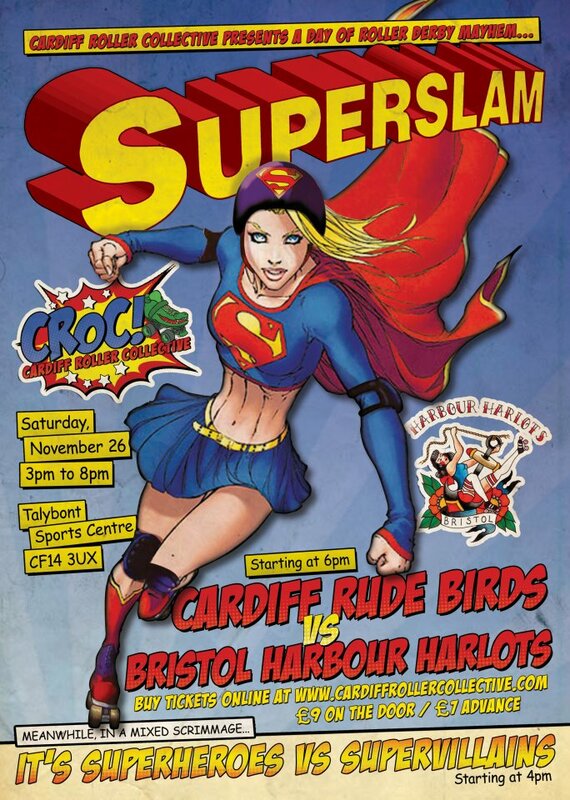 The Cardiff Roller Collective have recently made their presence known in the South Wales derby community by hosting the Isle of Fight Festival. 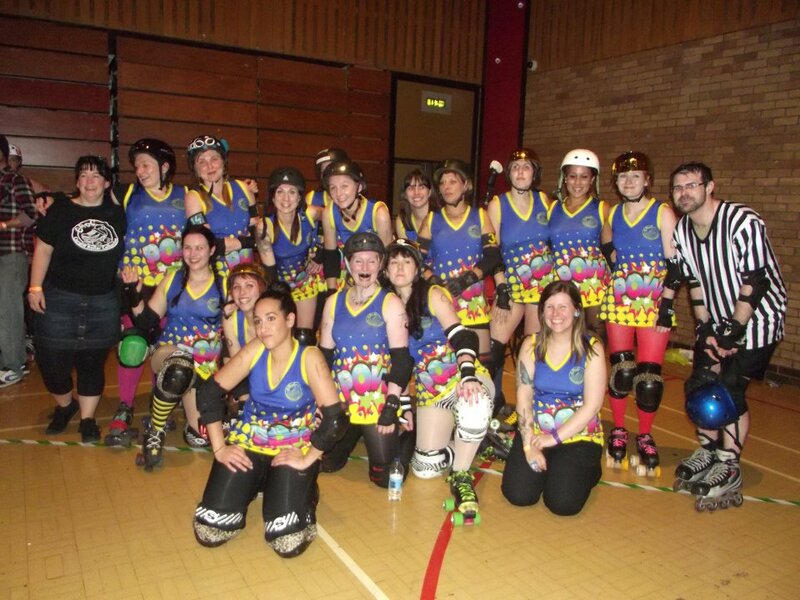 An open intraleague bout between my beloved Bridgend Bombshells and their CRoC counterparts, The Raiders of Roath Park. Oh, and since that apparently wasn’t quite enough derby goodness they also threw in the Saints Vs Sinners mixed exhibition bout; a bout which was originally intended to be a B team event but ended up being anything but – the calibre of the skaters was amazing! Tiger Bay Brawlers?! Bristol Harbour Harlots?! Those who turned up to support their friends in CRoC certainly got more than they bargained for! An intraleague bout is a strange thing. You would think that skating against the same people every week would create a bit of a rut. We all know how each person plays, we know their strengths, we know their weaknesses. Where’s the challenge? Well, that’s the challenge – if you know their weaknesses then they know yours. We weren’t approaching the bout as an unknown entity where our emphasis was on honing our own skills and upping our own game to the best of our ability. Oh no, this bout was ‘bespoke’. Tailored to not only our own team but to the abilities of the each skater. We couldn’t get away with our bad habits hoping that they wouldn’t be picked up until it was too late to be counteracted. It was game-on from the get-go. 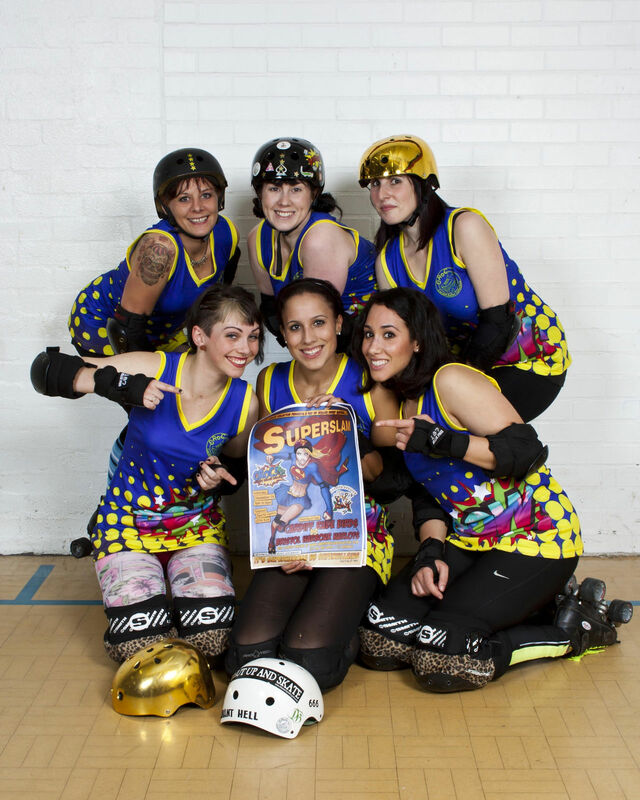 We offer 4 x roller derby sessions for £28 – that’s just £7 per session! We have spare kit including skates and protection available. Contact info_croc@btinternet.com if you fancy giving it a go or want to borrow kit. Alternatively head to our Facebook group and let us know that you are coming. * Times and locations are subject to change, so contact us for up to date information.